She’s finally here! 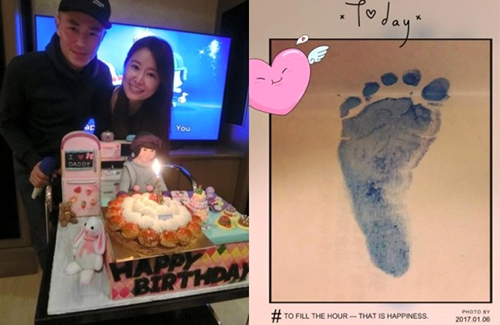 On January 6, Ruby Lin (林心如) shared an image of a baby footprint on Facebook, announcing that her baby daughter is born! Congratulations to Ruby and Wallace! 13 comments to Ruby Lin and Wallace Huo Welcome Baby Girl! a pretty girl with 2 dimples…she is going to be a beauty like mummy. Dimples do not necessarily mean anyone will be attractive or pretty for sure. It is more than looks anyways. Too bad can’t see the baby face and it doesn’t say what’s her name either. Hope to have a glimpse of baby some day. Congratulations to Ruby and Wallace. Ruby has 2 dimples on 2 sides, right? Recent interview she said she has 1 dimple on 1 side, but the comment below from her fan “Mrs Ruby has 2 dimples, one deep and one shallow mah”. Then I moved to see her above photo again, yes I saw 2 dimples. My guess before, that the belly was 4 month is proved to be correct today, instead of 3 months, haha, I’m surprised about myself. Congrats to them anyway! This will be one very pretty baby girl. Already guaranteed. Not necessarily since genes work in very strange ways. I have seen 2 not so great looking parents have really good looking kids and some really good looking parents have not so great looking kids. It really varies. So happy for this couple! I didn’t know that Wallace has a Weibo now. I remember seeing a interview where he didn’t seem so keen on using social media. @dreamy He still don’t have weibo and still not very fond of social media. The photo was posted through his working studio Huajae by his colleague. Such happy news! Congratulationsto the happy family!!! Congrats and hope they have a boy next time! Congratulations to the beautiful couple on a new little girl! May she be blessed with her parents’ good looks, haha, and be healthy.